Flat, caffeine-free clear sodas are sometimes recommended to help people keep up their fluid intake and recover from diarrhea. However, sodas can also sometimes cause diarrhea, especially if you drink a lot of soda or have an intolerance to one of the ingredients. 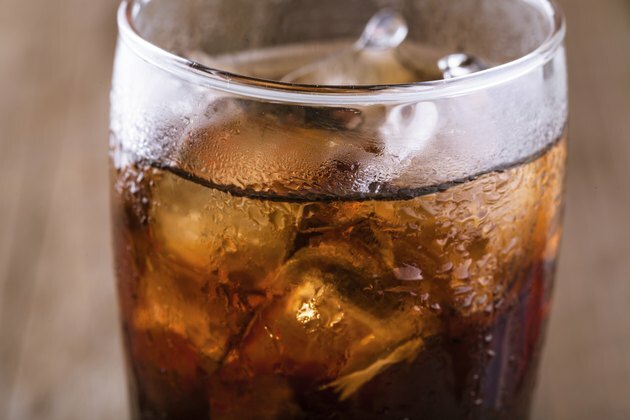 Caffeinated sodas can cause diarrhea if you drink a lot of them. Caffeine can have a laxative effect, but minimizing your caffeine consumption to no more than the amount in 2 or 3 cups of coffee per day, or 200 to 300 milligrams, may help limit this effect and may allow you to drink some soda without experiencing diarrhea. Colas and other caffeinated sodas range in caffeine content, with an average of 45 milligrams per 12-ounce serving. Some people have difficulties breaking down and absorbing the sugar fructose, which is found in the high-fructose corn syrup used to sweeten many regular sodas. In these people, drinking beverages high in fructose can cause more frequent and looser bowel movements. Other potential symptoms include bloating, heartburn, abdominal pain and gas. By avoiding all fructose-containing foods for a short time, including fruits, sodas, honey and alcohol, and then reintroducing them, you may be able to determine whether you are fructose-intolerant. Your doctor can also test you for this condition. Sugar alcohols are also sometimes used to sweeten low-sugar or diet sodas. These substances, including sorbitol, tagatose and mannitol, can cause diarrhea if you consume them in large amounts. Diarrhea and gas are more likely if you get more than 20 grams per day of mannitol or more than 50 grams per day of sorbitol, according to Harvard Medical School. However, some people experience gastrointestinal symptoms after consuming only 10 grams of sorbitol, notes the Center for Science in the Public Interest. Any soda that says "no sugar added" or "sugar free" on the label must include the amount of sugar alcohols it contains on the nutrition facts label, so you'll be able to determine which sodas contain significant amounts of sugar alcohols and how much you're getting. Certain other artificial sweeteners sometimes used in diet sodas could cause diarrhea, at least in sensitive individuals. Sucralose can have gastrointestinal effects, including gas, bloating and diarrhea. Some people who are sensitive to aspartame experience abdominal pain, nausea or diarrhea when they consume foods or beverages containing this artificial sweetener. Harvard Medical School: Are Artificial Sweeteners Safe?